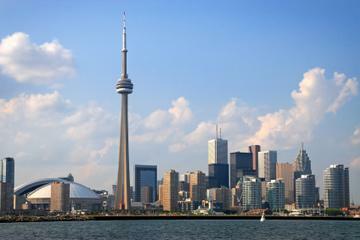 Toronto, the capital of Ontario, is the largest city in Canada and also one of the most diverse. It's home to a dynamic mix of tourist attractions, from museums and galleries to the world famous CN Tower and, just offshore, Toronto Islands. And just a short drive away is Niagara Falls. Visitors will find no shortage of things to do, from the vibrant Entertainment District, featuring the latest musicals and fine dining, to the historic Distillery District, home to unique shops and restaurants with al fresco dining, all set in incredibly restored buildings. The city center is relatively easy to navigate, with many of the top attractions within walking distance of each other and a subway system to cover longer distances. If you are visiting Toronto in winter, head indoors to explore the extensive network of underground walkways that connect shopping, entertainment, and attractions. In summer, wander along the beautiful waterfront and enjoy the beaches and parks. For a complete look at how to spend your time, see our list of top tourist attractions in Toronto. Toronto's famous landmark, the 553-meter CN Tower, is one of the city's must see attractions and also the most impossible to miss. Towering above the downtown, this Canadian icon can be seen from almost everywhere in the city. You have the option of simply appreciating the building from the ground, or taking a trip up to one of the observation areas or restaurants for fabulous views over the city and Lake Ontario. The CN Tower, built between 1972 and 1976, was once the tallest freestanding structure in the world, but has long since been surpassed. The highest viewing area on the CN Tower is from the Sky Pod at 447 meters above the city, with views that, on clear days, extend to Niagara Falls and New York State. To get here requires taking two elevators. Below this, at the top of the main elevator is the LookOut level at 346 meters, with floor-to-ceiling windows and the new Glass Floor, which looks down to the original Glass Floor, one floor below, where the Outdoor Sky Terrace is located. As the name suggests, the Glass Floor offers a bird's-eye view directly down over the city. For those looking for a little more adventure, or perhaps a lot more adventure, there is the "Edge Walk." This involves a hands-free walk on a 1.5-meter-wide ledge around the outside edge of the main pod, at an elevation of 365 meters. Participants are attached to a safety harness and rope. Located at 351 meters is the revolving 360 Restaurant, featuring fine dining and some of the best views from a table anywhere in Toronto. 360 is open for lunch and dinner, and visitors who dine here also receive complimentary access to the LookOut and Glass Floor levels of the tower. Basing yourself in the city center, preferably near the CN Tower, is the best option for exploring Toronto. For accommodation ideas in this area see our recommended luxury, mid-range, and budget hotels in Toronto. The Royal Ontario Museum, known as the ROM, is one of Canada's premier museums, with an international reputation for excellence. It houses an outstanding collection, which covers natural history, art, and culture from a great variety of periods from all over the world. It is also well-known for featuring exhibitions from across the globe. A controversial expansion in 2007 saw the addition of the Michael Lee-Chin Crystal, a modern wing featuring glass and sharp angles, added on to a very traditional older building. It's now one of Toronto's most recognizable buildings. One of Toronto's newest top attractions is the Ripley's Aquarium near the base of the CN Tower. This fabulous facility displays all kinds of marine life and is one of the most popular things to do in Toronto for families. The most impressive feature is the huge underwater tunnel with a moving sidewalk. You can watch the ocean world go by all around you as sharks glide past and sawfish linger on the tunnel roof above. This is a truly serene experience for all ages. Another unexpected highlight is the jellyfish display, accented with creative lighting. Further on, touch tanks with stingrays and small sharks allow for a hands-on experience. And for the engineering minded, the building's open concept also allows for a look at the Life Support System and filtration equipment operating the facility. Immediately adjacent to the CN Tower is Rogers Centre, a massive domed sports arena and home to the Toronto Blue Jays (MLB). The unique design includes a retractable roof, which slides back, allowing it to be opened in favorable weather. This mega-structure was completed in 1989 and can accommodate tens of thousands of spectators and is also used as a venue for other major events, including concerts. The center also offers one-hour guided tours with a behind-the-scenes look at the facility. Attached to Rogers Centre is the Toronto Marriott City Centre Hotel, with rooms that look out over the field. If you are in town to see a game, staying here is an extremely convenient option and a bit of a unique experience. The renowned Art Gallery of Ontario (AGO) is one of the largest museums in North America. The collection of more than 95,000 pieces includes works from around the world, from European masterpieces to contemporary art, but also holds an impressive collection of Canadian Art, including a vast collection of works by the Group of Seven. A series of temporary exhibitions are mounted throughout the year. The AGO occupies a unique looking building, with a mix of older and modern architecture, on the west side of the city center. Next to the AGO is the hard to miss Ontario College of Art and Design, standing high above the street on stilts designed to look like pencils. If you have never been, a quick day trip from Toronto to Niagara Falls is well worth the time. You can be standing on the edge of the falls in just over an hour. 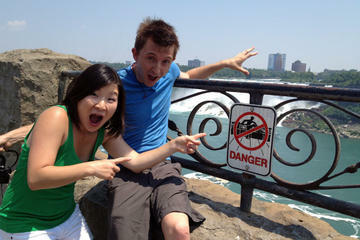 A tour to Niagara Falls from Toronto is an easy way to see the falls if you don't want to drive yourself. Tours offer hotel pickup and drop-off and include a Hornblower Niagara Cruise, which takes you up close to the wall of water tumbling that is the main Horseshoe Falls. Tours also stop at some of the key sites in the area, including Whirlpool Rapids, the Floral Clock, and the beautiful little town of Niagara-on-the-Lake. If you have enough time, you may also want to consider spending a night at Niagara Falls to explore the downtown and see the falls lit up at night. Toronto's answer to New York's Broadway, the Entertainment District comes to life in the evenings. This is the place to come to see major theater productions with the latest shows and musicals, concerts, and other performing arts. You'll also find a full range of dining options and places for socializing, as well as hotels. The main center of activity in the Entertainment District is along King Street. Toronto zoo has an outstanding and diverse collection, with approximately 5,000 animals. Some of the favorites include pygmy hippos, lions, tigers, giraffes, penguins, orangutans, and many more. The zoo is divided into several sections, each representing a major region of the globe. Some of the other highlights at the Toronto Zoo include the Gorilla Rainforest; the Tundra Trek, featuring polar bears; and the Great Barrier Reef. The Discovery Zone is a popular area with families, and during the summer months, a splash pad offers fun in the sun. The zoo lies on the Rouge River about 40 kilometers northeast of the city center. Standing in beautifully kept grounds, Casa Loma is an extraordinary building somewhat reminiscent of a medieval castle. It was originally constructed in 1914 for Sir Henry Pellatt, an eccentric Canadian multi-millionaire who was among the first to recognize and exploit the money-making potential of Niagara Falls. With close to 100 rooms, including three dozen bathrooms, the house is now a museum. Visitors can take a look back in time to a period of European elegance and splendor. Canada's foremost castle is complete with decorated suites, secret passages, an 800-foot tunnel, towers, stables, and five acres of estate gardens. The St. Lawrence Market houses a variety of vendors selling various food products, flowers, and specialty items. The St. Lawrence Hall was built in Toronto in 1850 and served as a public meeting place and a concert venue. The hall was restored in 1967 but has retained much of its old charm. The building provides a unique atmosphere for the market and is also occasionally used for film and television shoots. The interior features a grand staircase and a gas-lit chandelier. Dominating the spacious Nathan Philips Square with its bronze sculpture, The Archer, by Henry Moore, is the still highly acclaimed new City Hall. It was designed by the gifted Finnish architect Viljo Revell and built in 1965. City Hall consists of two arc-shaped high-rise blocks, 20 and 27 stories high respectively, wrapped around a lower central building topped by a flattened cupola. In the square in front of City Hall is a man-made pond, which becomes a popular skating rink in winter and is where the often photographed Toronto sign is located. This is a beautiful area to visit in December, particularly at night, when it's decorated for the Christmas holidays. The huge Eaton Center mall is located at the north end of the Central Business District. With its own subway station, this ultra-modern shopping complex extends over several blocks and is continually being renovated and enlarged. Strangers can quite easily lose their way in the bewildering maze of department stores, specialty shops, boutiques, restaurants, cafeterias, and snack bars, which crowd the different levels above and below ground. The original Eaton department store opened in Toronto in 1869 and grew into an enormous retail business. Toronto's Distillery District is a restored historic area, which has been transformed into a trendy entertainment and shopping district. Charming boutiques, galleries, artists' studios, and restaurants fill the old buildings. This is an interesting place to come during the day or evening and any time of year. A variety of entertainment events are held here, but one of the most well-known is the annual Toronto Christmas Market. Wooden stalls all decorated for Christmas sell unique gifts; a huge Christmas tree stands in an open square; and cozy outdoor areas are set up, often with couches and large fire pits to gather around. Restaurants offer outdoor dining despite the cold, with heat lamps and lap blankets. Hot chocolate is always readily available at this time of year. High Park is a huge green space with sunken gardens, hanging basket gardens, nature trails, natural ponds, and streams. The 165-acre country property, originally owned by the Howards, was deeded to the City of Toronto in 1873. This deed came with the stipulation that the park was to remain "for the free use, benefit and enjoyment of the citizens of Toronto and it be called High Park." Within the park is the High Park Zoo, home to a number of animals, including bison; reindeer; llamas; wallabies; and Toronto's famous Capybara's, Bonnie and Clyde, who escaped from their enclosure and quickly rose to fame, developing their own social media platforms in 2016. Other things to do and areas of interest in the the park include swimming and wading pools, playgrounds, picnic areas, and a scenic train tour. The grounds also include 19th-century recreated gardens, a Coach House, and the Howards' Tomb. Annually, the Canadian Stage Company puts on a performance at the open-air theater in the park during the months of July and August, known as "Shakespeare in High Park." The ferry trip from Queen's Quay Terminal to the Toronto Islands, about a kilometer offshore, is the prelude to a thoroughly enjoyable outing. There are lovely walks on the islands, as well as the opportunity for rowing, sailing, swimming, and other outdoor activities. In summer, the Toronto Islands are the venue for numerous open-air events. In favorable weather, there is a stunning view of the Toronto skyline. The Centreville Amusement Park is located on Centre Island, one of the Toronto Islands, and features a variety of children's rides. The Toronto Islands Ferry Service runs from Queen's Quay and travels to each of the main Toronto Islands. The Ontario Science Center is a family-oriented attraction with many interesting exhibits to entertain children. It occupies a site overlooking the Don Valley, about 10 kilometers northeast of the city center. Designed by the virtuoso architect Raymond Moriyama, this modern building was completed in 1969. Visitors to the center are brought face to face with the latest developments in technology, telecommunications, optics, biology, physics, space travel and meteorology, and much more, all presented in an absorbing and imaginative way. The emphasis is very much on visitor participation, with many interactive displays and widespread use of suitably installed computing and other equipment. For hockey fans, a trip to the Hockey Hall of Fame in downtown Toronto is a necessity. This is the place to learn about the all-time hockey greats: the players, the teams, and the games. It also offers a chance to see the Stanley Cup, along with a collection of important memorabilia, and an interactive display allows you to test your own hockey skills. This long alley in Toronto will look familiar to Canadians who have watched the long running TV comedy series, Rick Mercer Report. This is where he filmed his controversial news rants. Even if you have never seen this show, this is an incredible area that seems to go on forever. Tourists love coming here, posing in painted doorways and windows and taking selfies day and night. Graffiti Alley runs parallel to, and between, Queens Street West and Richmond Street West from Spadina Avenue to Portland Street. For sightseeing and entertainment, the best place to stay in Toronto is right downtown in the heart of the action. The hotels listed below are all highly rated and in good locations in Toronto's city center, within easy walking distance of many of the main attractions. Luxury Hotels: At the top-end of the luxury category is The Ritz-Carlton, with a convenient, central location near the Entertainment and Financial Districts. Delta Hotels by Marriott Toronto, just opened in 2014, has a great location near the CN Tower, Ripley's Aquarium, and Rogers Center, and offers good views over Lake Ontario. Near Eaton Center Shopping Complex and Toronto's famous City Hall and winter skating rink are the Hilton Toronto and Sheraton Centre Toronto Hotel, both luxury hotels with nice indoor/outdoor pools. Mid-Range Hotels: At the top-end of the mid-range selection is the Radisson Admiral Toronto Harbourfront on the waterfront. This is a great spot, particularly in summer, near many lakefront restaurants and an extensive waterfront pedestrian area and within walking distance of the CN Tower and other attractions. The hotel also has an outdoor pool. The Novotel Toronto Centre is another good choice, on The Esplanade, near the St. Lawrence Market and trendy restaurants with outdoor dining in the summer. North of The Esplanade and within easy walking distance of the Financial District and many attractions is the Holiday Inn Express, another quality mid-range hotel. A few blocks north of the popular Yonge and Dundas Square area is The Saint James Hotel, which is always highly rated. Budget Hotels: With a good location in Chinatown, on the eastern side of the city center, is the reasonably priced Super 8. The Downtown Home Inn is a bed-and-breakfast with a decent location in downtown, close to a major subway stop. Sightseeing: When it comes to sightseeing in Toronto, you can't beat the Toronto CityPASS for value. This is a nine-day pass that begins on the first day you use it, and offers savings on admission to some of Toronto's top attractions, including the CN Tower, Royal Ontario Museum, Toronto Zoo, Casa Loma, and the Ontario Science Center. For getting to the attractions, or just for general sightseeing, the Toronto City Hop-on Hop-off Tour is the best option. This is a three-day pass that allows you to explore the city at your own pace from the comfort of a double-decker bus. If you purchased the CityPASS, you can stop in and tour all the places listed on your pass. Day Trips: If you want to see Niagara Falls during your stay, the Niagara Falls Day Trip from Toronto is a must-do. This is one of the biggest tourist attractions in Canada, and it's less than an hour and a half away. This tour includes hotel pickup and drop-off, transport to Niagara Falls, a boat ride at the base of the falls, buffet lunch, a visit to the Whirlpool Rapids observation deck, and a stop at the beautiful town of Niagara-on-the-Lake. Places to Visit near Toronto: If you have time to explore areas outside the city, be sure to take a side trip to Niagara Falls, just a 1.5-hour drive away, and check out some other day trip destinations around Toronto. Within easy striking distance are some of Canada's top cities, including Ottawa and Montreal, just four to five hours away by car and easily accessible by train or short flights. For other ideas on what to see and do in the province, see our list of top attractions in Ontario. Ontario's Outdoors: Between spring and fall, nature lovers may want to enjoy some hiking, canoeing, camping, or relaxing at a lodge in one of the many Ontario parks, or soaking up the outdoors from the comfort of one of Ontario's top fishing lodges. Canadian Vacation Ideas: If you are coming to Canada for a short or extended vacation and arriving in Toronto, have a look at some of our Canadian itineraries to help plan the rest of your trip, or select a few of the highlights from our list of top tourist attractions in Canada.